The University of North Dakota hockey team is one of the oldest and most successful Division I programs in the United States. Students, fans, and alumni have now come to expect the winning excellence that is North Dakota hockey. The tradition is the product of two co-founders: the late Glenn “Red” Jarrett and the late Calvin Coolidge Marvin. Jarrett, an All-American halfback on UND’s 1930 football team became the football coach and athletic director in the spring of 1947. Jarrett then decided to make the move from club hockey. UND and the city of Grand Forks did not immediately stand by Jarrett’s decision because UND already had two men’s sports in football and basketball. Jarrett went ahead with his plan and got the Michigan Athletic Director, Fritz Crisler, to agree to a two-game series against the Wolverines in Ann Arbor. Jarrett worked hard to line up a schedule with other established hockey programs and scheduled games with Minnesota, Colorado College and Michigan Tech. While Jarrett set up the schedule for the Sioux, Marvin worked tirelessly to recruit players around the area. Marvin got the Johnson brothers: Russell “Buzz” and Milton “Prince,” who were already on campus playing for the semi-pro Grand Forks Amerks. Bob Murray, a World War II Veteran and a native of Warroad, Minnesota, like Marvin, was brought in to play goalie. Sticking with the Warroad theme were wings Gordon “Ginny” Christian and Wesley “Frisky” Cole, as well as George Dickinson and Ted Wilson. Standouts from Crookston, Minnesota, supplied center Jim Medved and defensemen John Noah and Bill Sullivan. Marvin, a defensemen, also served as an assistant coach to Don Norman. Marvin along with a cast of others that included the McKinnon brothers, Joe Silovich, Jim Doyle, Bob Krumholz, Art Forman, and Robert “Monk” Monroe, a student manager from Enderlin, North Dakota. This group of individuals were essentially a pickup team wearing used UND football jerseys and other makeshift equipment, but these men were not just any pickup team. UND’s first collegiate game was at Michigan, who went on to win the first NCAA hockey tournament. The Wolverines went on to lose only two games that season, one of them was the season opener against UND. The Sioux won 6-5 in its first collegiate game against Michigan in Ann Arbor. The first season, the Sioux compiled an 8-4 record against the top college teams that included Minnesota, Michigan, Colorado College and Michigan Tech. Since 1947, the University of North Dakota has gone on to hang eight NCAA National Championship banners inside Ralph Engelstad Arena. “The Barn” located on the southeast edge of campus beside the railroad tracks, seemed especially appropriate for the original indoor home of the Fighting Sioux. While it was known by various names including the “Winter Sports Building,” “The Barn” was a quonset covered with corrugated steel such as one you might find on a farmstead in rural North Dakota. Built in 1936 for $46,000 as a Works Progress Administration project, The Barn was also used by track and football teams and troops training for World War II. The fans at the first hockey games ever played in The Barn watched UND sweep North Dakota Agriculture College (NDSU) 6-5 and 5-0. The Barn provided an incredible hockey experience for any level of fan. Whether you were a young boy dreaming of playing for the Sioux, or you were one of the 4,000 UND students, fans, or alumni that jammed themselves into The Barn, the college hockey atmosphere created at UND was one of the most unique venues in the nation. The overall atmosphere of The Barn was created by not only the intense hockey and the crazy fans, but the overall character of The Barn which included the chicken wire strung between the pipes that served as a “poor man’s” Plexiglass, creating a very personal atmosphere among players and spectators. Also, the entertainment provided by the late Al Purpur during intermission watching him artfully resurface the ice with a pre Zamboni apparatus that he constructed and pulled across the ice. The Barn was the home of the Fighting Sioux hockey team up until 1972 when the home ice advantages of playing at there soon became handicaps. The Barn hampered recruiting and other teams would grumble about having to play in Grand Forks. The prospect of being forced out of its Division 1 college hockey status led members of UND to begin funding drives for a new winter sports venue. The final hockey game at The Barn was played on March 8, 1972 against the University of Michigan Wolverines in a league playoff battle in which the Sioux won 10-2. After 394 hockey games played over a span of 30 plus years The Barn was demolished in the summer of 1978. Despite some disapproval of the demise of the old Barn, fans flocked to the new UND hockey arena at its opening day in the late fall of 1972 and found an awe inspiring sight. Sparked by bright illumination, a glistening ice surface, shiny Plexiglass, alternating green and white backed seats, a modern, multi-sided scoreboard over center ice that brought gasps of delight and appreciation from fans and a feeling that the UND hockey program had finally arrived at the national level in all aspects. Official dedication for the $2 million dollar facility occurred on January 13, 1973, which included a 2-2 tie with the University of Minnesota. The campaign in charge of funding for the new hockey facility was lead by the late John O’Keefe, a Grand Forks businessman and civic leader, the late Len Marti, former UND Athletic Director, and Earl Strinden, a staff member of the Alumni Association. Funding for the facility came from $800,000 in student bonds, $500,000 from the Edmond A. Hughes Estate, $240,000 from Alumni across the nation and special friends, and $460,000 from a local fund drive. An added bonus for the hockey game brought by the new facility was the broadening support spurred by the comfort, class and capacity of the new facility. Even people who seemed oblivious to UND hockey quickly and enthusiastically joined the legions of followers. Hockey games became a social event for those from near and far. But the luxury and spaciousness didn’t end with the building’s original construction. The increased demand for more seats and more space had to be met. The seating of about 5,700 was expanded to about 6,100. Fans were able to spread out even more with the addition in 1983 of a three story, 14,000 square foot lobby, which increased the original size of the arena by about 15,000 square feet. Besides the additional space and seating, also added were a specially designed and designated gathering place for Sioux Club members, the UND athletic Hall of Fame, the Sioux hockey All-American wall, coaches office and players lounge, and interior ticket booths. The $750,000 addition was funded by the UND Foundation from part of a large gift provided by 1906 Alumnus Kenneth Hyslop. On February 19, 1988 the building was christened Ralph Engelstad Arena in honor of the 1954 UND graduate and former Sioux goalie from Thief River Falls, Minnesota. After his time at UND, Engelstad went on to own and manage a number of successful enterprises, including the Imperial Palace in Las Vegas, Nevada. 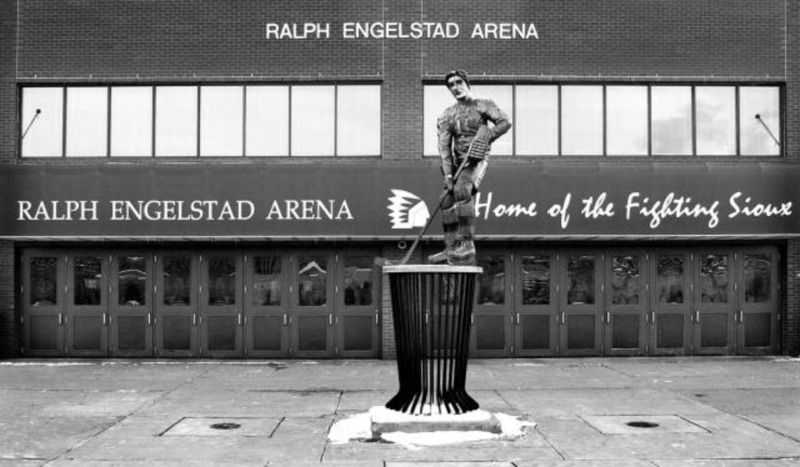 The original Ralph Engelstad Arena was frequently mentioned in a survey done by former players of the WCHA as one of their favorite places they ever played. It is nearly impossible to describe the $104 million Ralph Engelstad Arena in just a few words, but it is described by many as the finest facility of its kind in the world. UND fans see “the Ralph” as a dream come true. A dream that started for all hockey fans in December 1998, when alumnus and Las Vegas businessman Ralph Engelstad announced that he would donate $100 million to the University of North Dakota and use it to build the best possible hockey arena for his former team. A former goalie, Engelstad had been such a tremendous supporter of the team and The University of North Dakota for nearly half a century. Engelstad started the dream by putting together a small group to visit the top hockey facilities in the world. The group included former UND President: Thomas J. Clifford, former standout Sioux player and Minot businessman: Reggie Morelli, Executive Vice President of the UND Alumni Association and Foundation: Earl Strinden, UND head hockey coach: Dean Blais, architects: Jim Kobetsky and Bill Schoen of Schoen Associates, and the former arena General Manager: Todd Berning. Tapping into his construction know-how, Ralph had a hand in almost all major decisions in the building and brought a lot to the table in the same aspect. One of the things Engelstad brought to the building project was a long-range view of the building process which he had mastered in his business days building housing developments and the Imperial Palace Hotel in Las Vegas, Nevada. The team announced a very ambitious time schedule which contributed to the uniqueness of the project. Builders were carpeting one end of the arena while the other end was putting up the steel beams. The groundbreaking started in November of 1999 with an October 5, 2001 deadline. Over 2,500 workers, mainly from North Dakota, were hired to build the arena. The construction of the arena moved very quickly and smoothly due in large part to Ralph’s ability to communicate with the builders and contractors, often speaking with the contractors on the phone several times a day. Ralph’s goal was to construct not just a first class hockey facility, but to construct an arena where fans would have the experience of a lifetime. Every idea that went into the designing of the arena was to ultimately heighten the fan’s experience at the Ralph. Ralph had a hand in everything that went into the arena from the acoustics to the Zamoboni, and everything in between. For Ralph Engelstad, the arena is a gift to his alma mater, his former team, North Dakota and the surrounding region. For fans, the hockey team, and The University of North Dakota, you might say it is a dream come true.